The SLP2's three-inch blade of 420J2 high carbon stainless steel opens with one hand using the large thumb hole in the blade and locks into place with a dependable frame lock. All-steel construction eliminates breakage issues. The SLP2 in general has a much more solid feel than the less competent SL1. The hollow ground combination edge offers quick cutting in emergencies and leaves enough plain edge for detail work. Pocket clip carry eliminates the need for a sheath. The piggyback compartment holds a lot more than a magnesium firestarter -- which is still there, but at the back end of a small waterproof LED flashlight. A striking plate built into the base of the handle creates sparks for a fire, so there's no need to wreck the blade just to keep warm. The magnesium fire stick should provide a thousand good spark strokes. If you need to practice your fire-making skills, it will still have enough left for the real situation. Though the knife comes equipped with the firestarter insert, two other models of tool inserts also fit the SLP2. 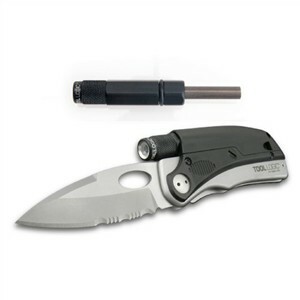 One is a trouble light -- the same basic flashlight as here but with a swiveling magnetic base -- and the other trades the firestarter for a diamond grit file.